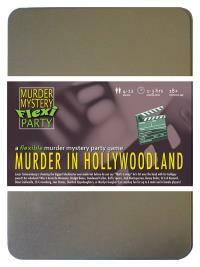 You've been invited to play the role of JEM HUNTER in Murder in Hollywoodland. You're invited to a star-studded yacht party, as Lucas Cameronburg is shooting the biggest blockbuster ever made! But before he can say "That's a wrap! ", he's hit over the head with his Goldguy award and pushed overboard! Join us to find out who cut Cameronburg from his own film! Your family’s wealth meant it was never that difficult growing up, but being a grown-up is a lot more difficult. The closest you’ve come to a proper job is buying and selling expensive objects of desire, but after your father realised you were selling the family’s antiques and changed the locks, you began trawling the world for stock. In the meantime, after a brutal one-day defeat on the TV word quiz “CountUp” you decided that being on camera was “the nouveau noir” and have recently been pursuing your acting career too. Pleased to meet you all, I’m Jem and I like acting and treasure hunting - the term “tomb raiding” is so last decade. Mr Cameronburg hired me to star in the third act, most of which is spent underwater, scuba-diving through caves. Yesterday I noticed he has a glass floor in his cabin, presumably for checking out life on the sea floor and not just me swimming around in my bikini. Anyway, I was in my cabin all last night, rehearsing my lines and practising holding my breath.